As more and more states decide to legalize and regulate marijuana, businesses outside of America’s new billion dollar marijuana industry around the country are doing their best to navigate the murky waters of entering into partnerships with state-sanctioned marijuana businesses. Some are responding by adopting new company policies more considerate of state laws that grant marijuana-related businesses the freedom to engage in activities that are still prohibited by the federal government (e.g., sale and distribution of marijuana). On the other hand, some of the largest and most well-known social media platforms such as Facebook and Instagram have decided to steer clear of the issue all together. Instead of evolving like the majority of the American public, where more than 68% support the legalization of adult-use marijuana, they appear to be aggressively suspending social media accounts of marijuana-related businesses while offering little to no explanation as to why. Without question, companies, regardless of their products or services, need a strong presence on social media to compete, and ultimately survive in today’s digitized marketplace, but social media accounts of state-sanctioned, legal marijuana businesses are routinely being shut down without warning, and frankly without just cause. This is a devastating blow to companies that have invested time, money and energy into building robust following of tens of thousands of dedicated supporters and potential customers. That’s why I believe the focus should be on ending the federal prohibition of marijuana by encouraging members of Congress to pass HR 1227: The Ending Federal Marijuana Prohibition Act, S.3174: The Marijuana Freedom and Opportunity Act, or S.1689/HR 4815 The Marijuana Justice Act. 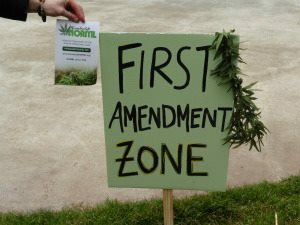 Not only would marijuana-related companies be able to promote their events and market products on Instagram, Facebook and other social media platforms, it will end the harassment, arrest, and incarceration of marijuana patients and consumers, not to mention all of the collateral consequences related to a marijuana charge (e.g. employment and housing discrimination). I’m in no way trying to minimize the challenges with censorship that business owners operating in the marijuana industry are facing, but merely trying to redirect focus to the root of the problem. Currently there are numerous business-centric marijuana law reform bills being considered by Congress, and while NORML’s focus continues to be on ending marijuana prohibition and being a voice for marijuana consumers, we are generally supportive of these efforts. We at NORML understand and appreciate how marijuana consumers benefit when a company has access to basic banking services such as checking accounts, small business loans and merchant services. We understand that without a stable and predictable environment where businesses can thrive, consumers will be the ones to suffer at the end of the day. For a comprehensive list please visit NORML’s Action Center. As a nonprofit organization that’s focused on the larger goal of ending federal marijuana prohibition, we also promote business-centric marijuana law reforms to our members and supporters. If your business would like to support our efforts, please consider becoming a sponsor today! Whether you’re a longtime business owner or new to the marijuana industry, we’ll recognize your company on our website and social media for supporting NORML’s longstanding mission of reforming marijuana laws in our country. For more information about becoming a NORML Sponsor click here!